The accessible 170km route traditionally encircles Western Europe's highest mountain, crosses through 3 different countries and introduces walkers to some of the most dramatic alpine scenery in the world. The Tour du Mont Blanc encircles the Mont Blanc massif - the so-called "Monarch of the Alps", that serves as an ambitious feat for almost 20, 000 ambitious climbers every year. While the mountain itself, often cited as one of the deadliest in Europe, is not for the faint of heart, the routes that surround the massif, beg adventurers from all walks of life to explore its mighty slopes. The scenery is imposing, dramatic and undeniably spectacular, but most importantly is also accessible. The Tour du Mont Blanc is a walk that doesn't require technical skills, has plenty of accommodation and is well-marked for the tens of thousands that walk the trail every year. For the adventurous solo traveller that is looking for a ten-day getaway and good introduction to long distance walking in the alps, there is nowhere to look further. The main route is the most popular long distance alpine walk in Europe. Walkers have been encircling the mountain's well-trodden trails since the 1760s. The main trail itself is visible and difficult to stray off of, but most importantly for first-time walkers doesn't require a heavy reliance on the use of a compass or map reading - so long as the weather is cooperative. Yellow signs are labelled at the intersection of every trail on the TMB. There are plenty of way-markers too, on trees, rocks and even buildings, that are painted white with a red horizontal line across the middle to mark the main route. Those who live in the villages along the TMB are all too familiar with questions from walkers in the summer months and are more than familiar with the trails and waymarkers. They are also very friendly and very willing to help tourists from all over the world. 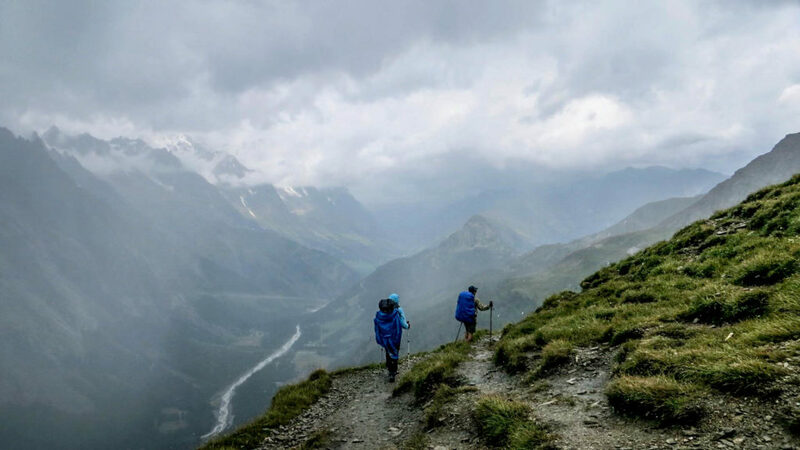 Out of all the problems to occur on a Mont Blanc trek, getting lost is rarely one of them. I recommend purchasing what I fondly remember many trekkers calling, "The Bible": Kev Reynolds' The Tour of Mont Blanc: Complete Two-Way Trekking Guide. I can guarantee almost every English speaker on the trail has this book in their backpack. It's the definitive and standard guide to the route, filled with day-by-day maps, accommodation lists and info about the varying routes. You don't need to be skilled with map-reading for this book. It's a very detailed and concise guide. The trail and its alternatives are underneath the shadows of Mont Blanc's mighty peak, but there isn't any actual technical climbing involved. Each day you'll be walking up to high alpine ridges, but there isn't any need for expensive gear. There's no helmets needed, no harnesses and no ropes necessary. The Tour du Mont Blanc ultimately isn't a steep trek. This may come to the surprise of some because of its location in moderately high alpine territory. Nonetheless, you will be walking up high ascents for hours - do some training and come physically prepared for the long walk. Also, be prepared to invest in some good hiking boots with solid ankle support. A number of mountain huts have been built around the mountain, which creates numerous benefits to those attempting to complete the long distance route. For one, those who want to pack light don't need to bring extra baggage for a tent, cooking utensils or too much food. 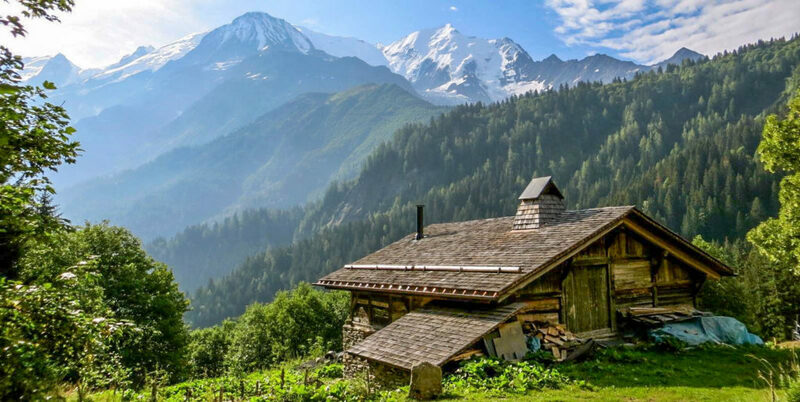 There's on average a mountain hut every 10 kilometres on the route which will provide hearty, local cuisine and comfortable accommodation each night. You can actually drink water from some streams that flow from alpine glaciers. You don't get that in the city, do you? The variety and multitude of the huts also allows walkers a lot of lee way to customize their itinerary. 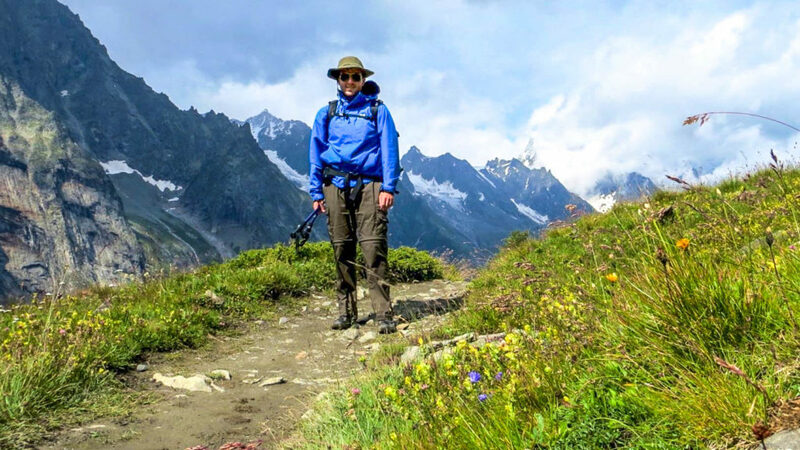 The beauty of the TMB that makes it attractive to first-time walkers is that it can be done in a variety of ways - clockwise around Mont Blanc, counter-clockwise, or you don't even have to do the entire route at all. 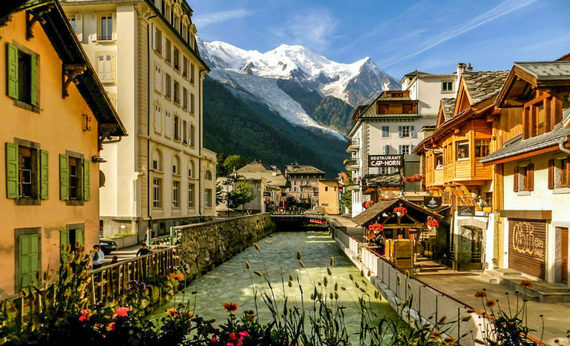 At the halfway point of each route are two cities -- Courmayeur, Italy, and Chamonix, France. You can start or end your trip here. Each have accessible public transport to major cities and airports. The TMB attracts tens of thousands of people every year. It's no wonder there is so much accommodation. Despite the immense popularity of the route, I walked the TMB in high season (early August) and was able to book accommodation when I arrived at the huts on the day-of. I didn't have to be bound by a reservation, which gave me ease of mind during my hike (I'm not an Olympian, after all). I truly could go at my own pace. But for peace of mind, you can always request a hut owner to call another hut for next-day or same-day reservations. Three. In one walk. 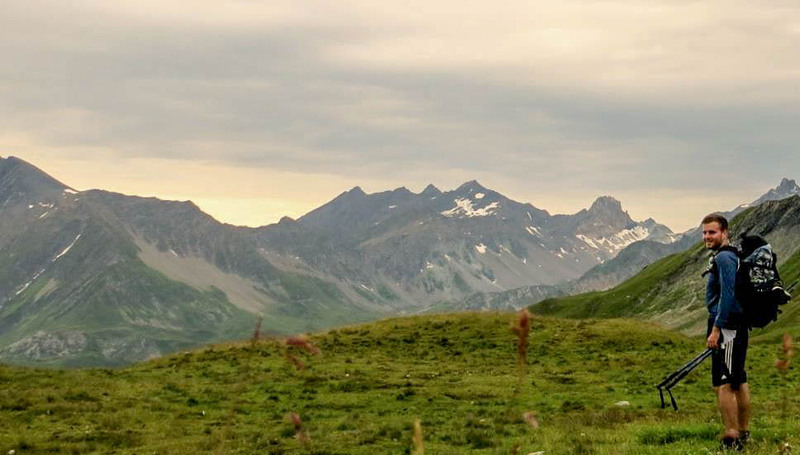 It doesn't matter where you start your hike, whether it's in France, Switzerland or Italy. There's no formal start or end point. In the morning, you could be eating French cheese and in the evening you could be having a hearty plate of pasta in Italy. The closeness of all three cultures is a symbol of what makes travel through Europe truly spectacular. Since all countries are all a part of the European Union, you don't need to cross a formal border or apply for any special visas. You could literally ascend over a mountain in one country and descend into another country without noticing. The TMB is a high route. Rather than walking through the valleys between the peaks surrounding the Mont Blanc, you're on the slopes of the mountain itself. You're at level with some of Europe's highest alpine peaks and some of the most picturesque alpine lakes in France. The vastness and isolation from city life is something you would only think you can read about in adventure novels. It's a dramatic, ambitious landscape. It's no wonder thousands come here every year. There's long stretches on the trail, but because of the popularity of the TMB worldwide, you're always bound to find another walker. You might even see the same people everyday if they're following an itinerary similar to yours. If you're ever lost, there's almost always an experienced hiker on your trail. Yet, because the trails are so many and vast, the popularity of the route never really shows. You won't see hundreds of people on the trail at a time, so there's a bit of solitude too, if you'd like. -The Tour du Mont Blanc is first and foremost a walk, not a climb. Climbing the Mont Blanc massif is a whole other story and should never be attempted unless you have serious mountaineering experience under your belt. The Mont Blanc takes lives every year - most often because of unpreparedness. -That being said, any hike through mountainous terrain poses risks. Despite the well-marked trails and the amount of accommodation and people on the trail, weather conditions can increase the difficulty of the trail in a second. Always have a map, a guidebook and don't brave a day's walk if there is thunder. -Prepare yourself physically. The Tour du Mont Blanc is a walk, but not one that's being done in a park. You'll be walking on average between six to seven hours a day for ten days. Prepare yourself before the trip rather than during the trip.